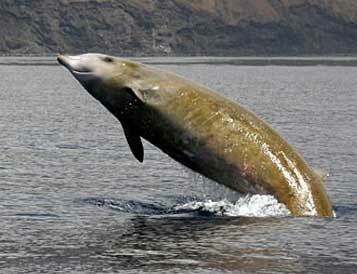 The Cuvier's beaked whale is one of the most abundant beaked whales in the world. They can be found in all oceans of the world but they steer clear of the Polar Regions, shallow water and the coastal areas due to their need for deep seas rich in squid. These proficient hunters dive as far as 1900 metres to the ocean depths to reach these prey and they have the ability to hold their breath for up to 40 minutes at a time. Usually they live in family pods of up to 7 members.